VISALIA, CA - The Visalia Rawhide will become its Latinx alter-ego, los Toros de Visalia, for the third straight season during select series' in conjunction with MiLB's Copa de la Diversion program. Los Toros will play at home May 3-May 5 and July 23-July 28. This is the first season los Toros will also play on the road, in leu of all 8 California League teams being selected to participate in this award-winning national program. Those road games are April 26, May 9, June 29, July 6, August 9, and August 31. "Taquiza y Toros": July 23-28 vs. Los Churros de San Jose & Lancaster During these series' fans can look forward to enhanced Latin cultural food & beverage elements throughout the ballpark, including tacos, raspados, micheladas, margaritas, elote, and more! You can also expect mariachi music, folklorico dancers, Spanish dancing horses, and themed between-inning activities like "Grito por tu Burrito". 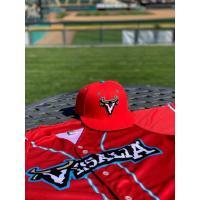 Today, Visalia unveiled new Toros uniform additions, including a red & teal Road jersey with 'Visalia' across the front chest, and the 2019 edition of the Toros on-field hat, which is also red & teal. These new caps can be purchased at the ballpark, or online at www.RawhideBaseball.com. The Rawhide will continue to celebrate the Hispanic culture in the community throughout the season and off-season. In addition to the Toros series', Rawhide Ballpark will host two events, Lucha Libre on May 31st and MicheFest (michelada festival) on September 29th. Lucha Libre is back for the second year and fans will be able to interact with the Lucha wrestlers before the matches begin and enjoy a night of family-fun entertainment. Tickets are only $10 each and are available now! MicheFest is new this year to Rawhide Ballpark, but it will become THE Hispanic Heritage celebration of the Central Valley, including prominent Latin music artists, as well as Lucha Libre wrestling, a michelada contest, and a cultural art exhibit. The headlining performer for this inaugural event is Los Tigres del Norte, who are the only Latin music group to have a star on Hollywood Boulevard. There will be a firework show at the end of the night to conclude the event. General Admission tickets are only $50, and VIP tickets are $120. Tickets are on sale now through www.MicheFest.net. If you are interested in being a vendor for this event, or a competitor in the michelada contest, you can email Joanna@rawhidebaseball.com. "This has become my most favorite promotional series of our season." says Jennifer Reynolds, Rawhide General Manager. "It's impossible to get into the theme of these games - from the ballpark workers, to the fans, to the players on the field - everyone enjoys the cultural elements of these games. It's great food, festive music, and excellent baseball as we are nearly undefeated as 'Los Toros'!" "The game of baseball is a very big deal in Latin American countries, and this national campaign brings some of that cultural flavor to the game here in America, which I know means a lot to our Latin players & coaches" says Reynolds. For more information on these, or other Rawhide/Toros promotions, visit www.RawhideBaseball.com.